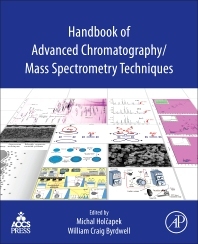 Handbook of Advanced Chromatography /Mass Spectrometry Techniques is a compendium of new and advanced analytical techniques that have been developed in recent years for analysis of all types of molecules in a variety of complex matrices, from foods to fuel to pharmaceuticals and more. Focusing on areas that are becoming widely used or growing rapidly, this is a comprehensive volume that describes both theoretical and practical aspects of advanced methods for analysis. Written by authors who have published the foundational works in the field, the chapters have an emphasis on lipids, but reach a broader audience by including advanced analytical techniques applied to a variety of fields. Handbook of Advanced Chromatography / Mass Spectrometry Techniques is the ideal reference for those just entering the analytical fields covered, but also for those experienced analysts who want a combination of an overview of the techniques plus specific and pragmatic details not often covered in journal reports. The authors provide, in one source, a synthesis of knowledge that is scattered across a multitude of literature articles. The combination of pragmatic hints and tips with theoretical concepts and demonstrated applications provides both breadth and depth to produce a valuable and enduring reference manual. It is well suited for advanced analytical instrumentation students as well as for analysts seeking additional knowledge or a deeper understanding of familiar techniques. Professor of analytical chemistry and head of mass spectrometry group at the Department of Analytical Chemistry, University of Pardubice. His research started with the structural analysis of organic and organometallic compounds using mass spectrometry (MS) and its coupling with liquid chromatography, focused mainly on the metabolism of pharmaceutical and natural compounds. His present specialization is the lipidomic analysis of biological samples using liquid chromatography and supercritical fluid chromatography coupled to MS, shotgun MS, MALDI-MS and MS imaging. He has coauthored over 110 papers in peer-reviewed journals with h-index of 33 and given over 300 conference presentations including over 20 plenary and keynote lectures. He is a member of editorial board of Analytical and Bioanalytical Chemistry; Lipids; a guest editor of special volumes on Mass spectrometry in Journal of Chromatography A (2010, 2012 and 2016), Lipidomics in Analytical Chemistry (2014) and Analytical and Bioanalytical Chemistry (2015), editor of the book Extreme Chromatography: Faster, Hotter, Smaller (American Oil Chemical Society, 2011), and on Power List of 100 most influential people in the analytical sciences (The Analytical Scientist, 2013 and 2015). Research Chemist with the United States Department of Agriculture, ARS.Currently Dr. Byrdwell is working on analysis of vitamin D and other fat soluble vitamins and triacylglycerols using triple- and quadruple- parallel mass spectrometry approaches, combining the best aspects of three or four mass spectrometers employing complementary ionization methods in LCx/MSy techniques.